Cheops' rebuilt vessel, 142 feet long and 19 feet wide, is seen bow on. The framework enclosing the cabin may have provided a form of air conditioning by supporting dampened reed mats. A diagrammatic overview pinpoints the canopy at the bow and a stubby gangplank at the waist. 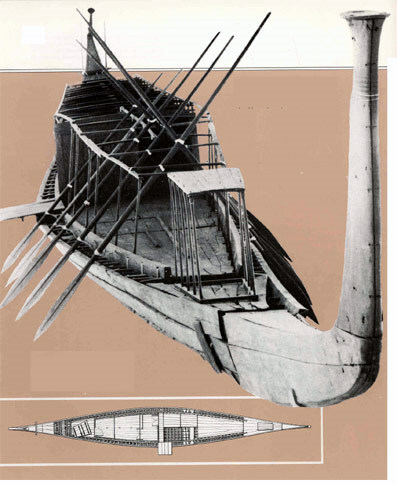 Cutaway sections reveal the inner structure, and an overturned portion of deck planking shows its ribbed structure. 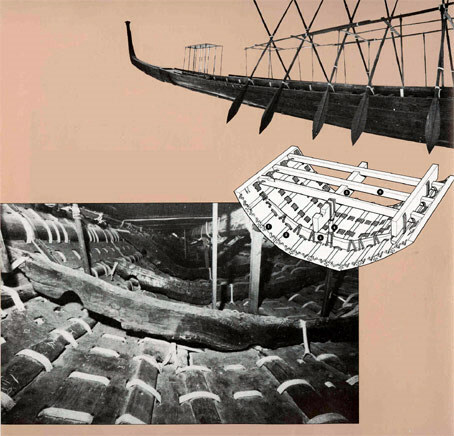 Early Egyptian shipbuilders made Cheops' barge watertight by weaving grass ropes through seam holes in the hull planking; when wet, the ropes shrunk, the planks and batterns swelled, and the seams closed. Ribs were laid on top of the planks, and stanchions were fastened to the ribs to support a beam. The beam, in turn, held perpendicular deck beams.